Today is Day 3 of Tulip Week and I will be talking a little bit about tulips - different types of tulips and how to look after them. I'm also showing ten of my own images - and surprise, surprise they are all pink. Well, I'm not particularly girly but I still happen to like pink! 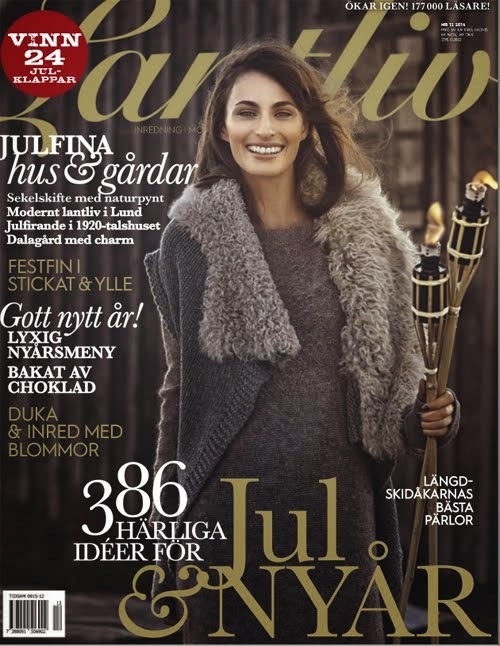 Tulips are available in the northern hemisphere from about October/November to May/June. They come in many different colours, shapes and forms. The ones mostly available are single and double tulips. 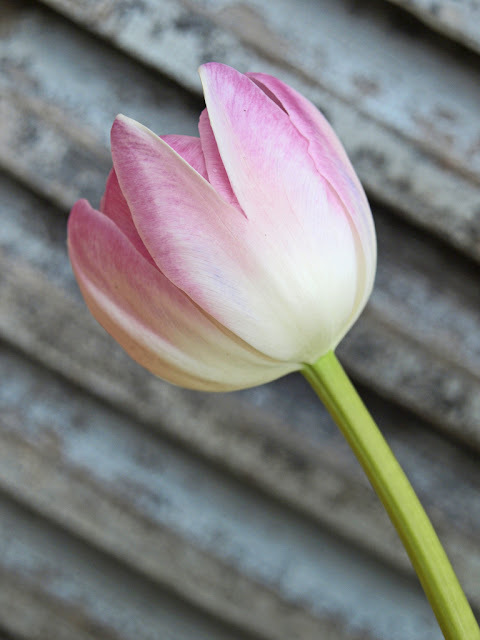 Single tulips have six petals and double can have as many as twelve petals. You can also get parrot tulips that has ruffled petals, fringed tulips with serrated edges and goblet-shaped tulips called lily-flowering. 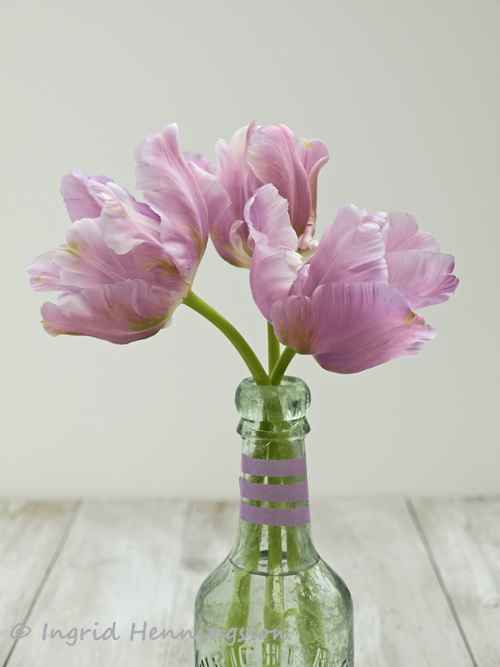 You can also sometimes find what is called French tulips. They are specially grown for the florist trade as they have bigger flowers and much longer stems and the price is accordingly. 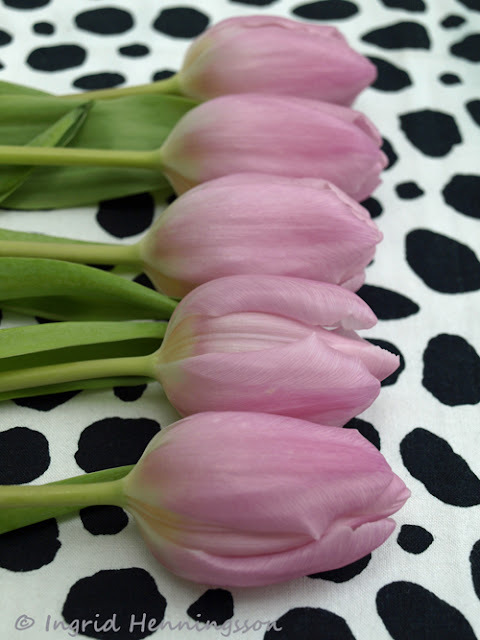 Tulips come in a very wide variety of colours from pink, purple, white, red, orange and yellow to striped and variegated colours. If you look after them they can last for about 5-10 days. Condition the flowers as soon as you come home by removing any leaves that would end up below the waterline in the vase, as well as any broken or damaged leaves. Cut the flowers by removing about 2-3 cm from the bottom of the stems. You are often advised to cut off the white part of the stem and that can sometimes be more than 2-3 cm. The white part of the stem does not take up water as effectively as the green part. Make sure you cut at a diagonal to create a bigger area for the flower to absorb water. Place them in cool water and keep them in a cool place until you are ready to make the final arrangement. Display your final arrangement out of direct sunlight, away from fruit and vegetables as well as radiators and electronic equipment that creates heat. To make sure your flower last as long as possible re-cut the stems every 2 days, clean the vase and fill the vase with fresh cool water. 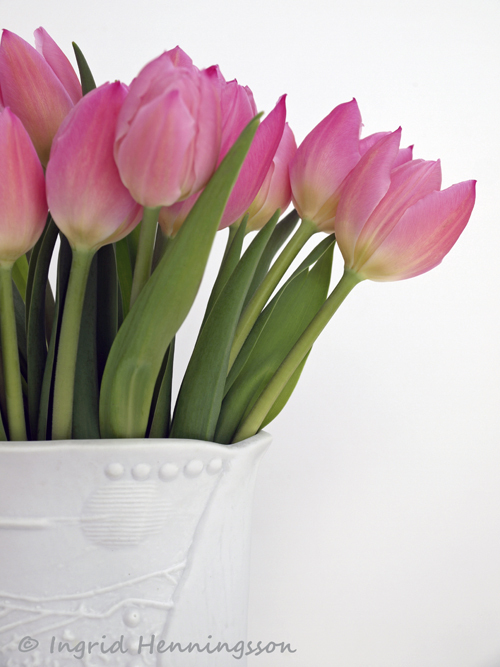 Tulips are both phototropic and geotropic - they reach for the light and they are affected by gravity. On top of that they also continue to grow in the vase as much as five centimeters. So this is why they keep bending, reaching and move around in the vase. 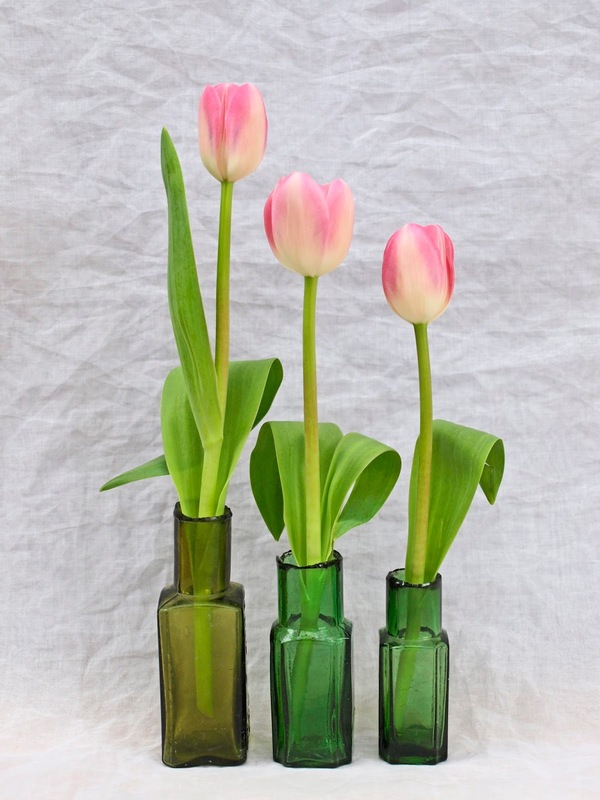 Some people like their tulips straight and if that is the case, you can after conditioning the flowers, try wrapping them tightly in newspaper and leave them in water for a while. Some other ways is to use a vase with a just big enough opening that will support the flowers, another is to cut the stems short and use bottles or bud vases. 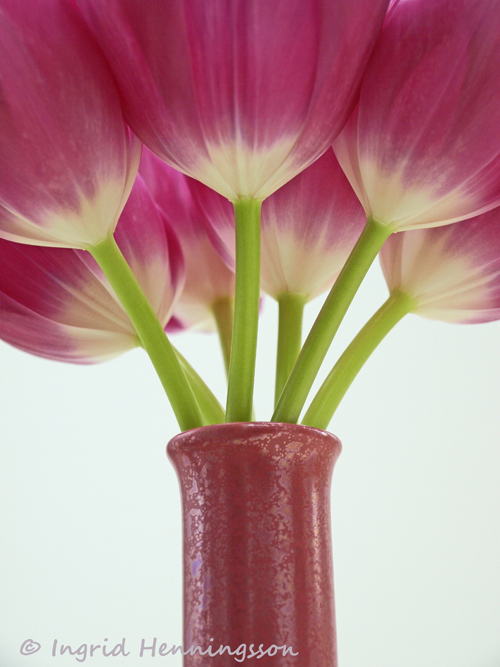 I have also found that a lot of people like their tulips to 'dance around' in the vase and let them do their own thing. Whichever look you prefer tulips will always be a beautiful and welcome flower at this time of year. 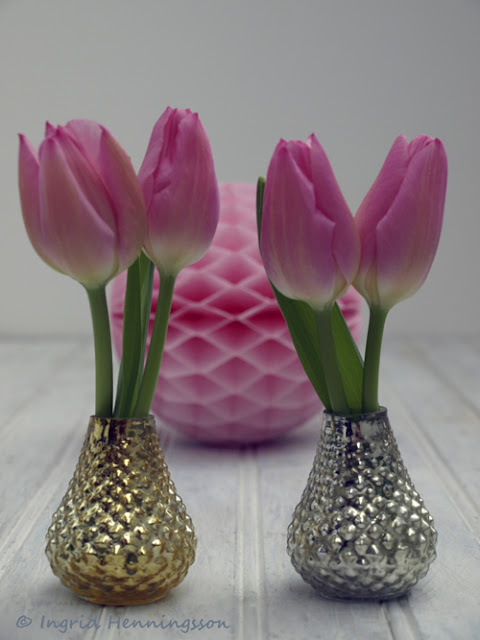 Enjoy your flower arranging and have a fabulous floral Wednesday! I'll see you again tomorrow with Day 4 of Tulip Week. 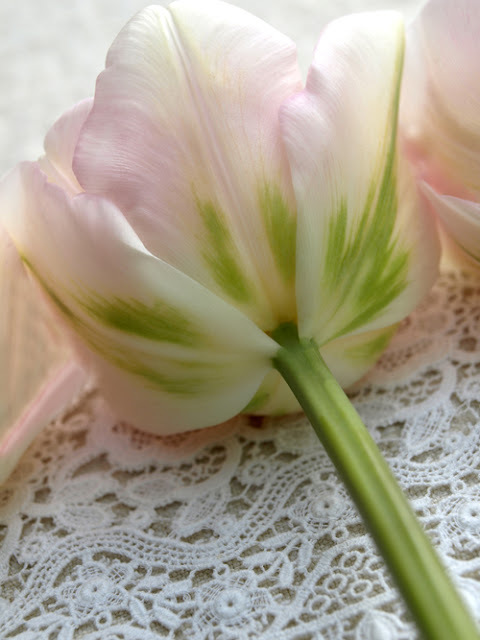 I will suggest a few books that can give you some more inspiration and further information about tulips. So Beatyful! <3 Now I have to clean my house and go get some Tulips also! 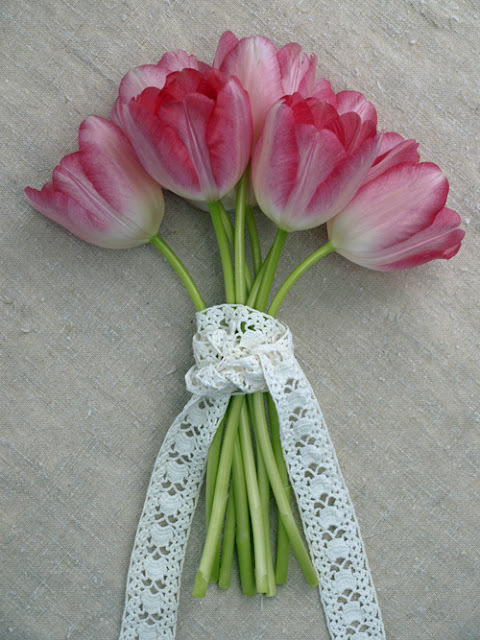 :) Have a great Tulip week! I picked my first forced tulips last Sunday 1st February, I'm thrilled with them; I used them in my Vase on Monday post and showed some macro shots yesterday. 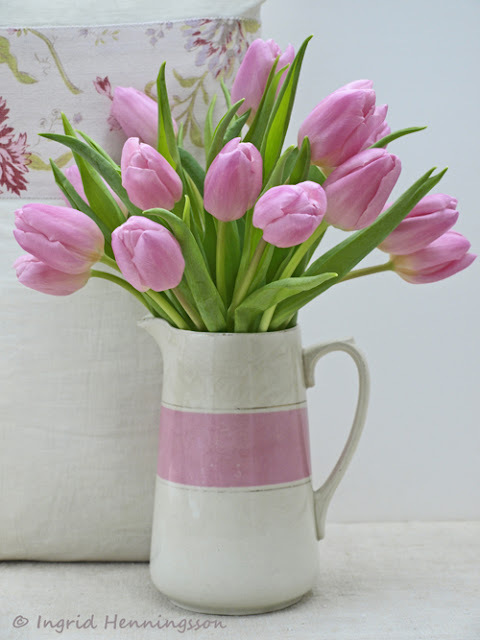 Tulips are my favourite spring flower. I was sent a link to you by Diana at Elephants eye on False bay.